Headaches can really ruin your day. Whether they’re migraines, tension-type or sinus headaches – they’re the absolute worst. So many of our chiropractic patients in Oakville suffer from chronic headaches and don’t seek treatment. That is over 15 headaches a month for more than 6 months. That’s crazy! Spinal manipulation, specific exercise and massage therapy are all part of the guidelines for the treatment of headaches, but did you know acupuncture in Oakville can also help? Acupuncture has been proven to help reduce the intensity, duration and frequency of headaches. Acupuncture treatment can also decrease the number of painkillers that headache sufferers have to take, and that is always a good thing. There are two types of headaches that acupuncture is particularly helpful for; tension headaches and migraines. 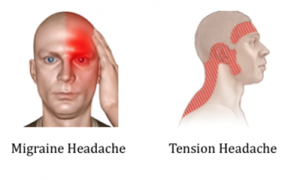 Tension type headaches feel like a tight band around the eyes and forehead. Typically they are felt on both sides of the head at the same time, in the temporal area and behind the eyes. A migraine type headache is usually a throbbing pain felt on one side of the head. It can have associated nausea and vomiting and sensitivity to light or sensitivity to sound. Headaches can be the result of referred pain from tight muscles in the neck and back of the shoulders or be caused my stuffy sinuses! There are over 100 types of headaches in total, all with different causes and symptoms! Acupuncture can help all kinds of headaches. Treatment will almost always include a point in the hand that is an excellent point to help relieve pain in general. This point can be included in treatments in any area of the body because it is such a powerful painkiller! For headaches specifically, treatment will include points in the back of the head and neck and for most patients an electrical stimulation can be applied to make the treatment even more effective. If you are experiencing sinus headaches, or headaches in the forehead region acupuncture can also help relieve that pain. Needles that are inserted into the face are very small and fine to make the insertion painless. Most treatments last about 15-20 minutes and you can just be still and relax while the needles do the work! If you’re experiencing headaches, whether they occur once in a while or frequently, come visit us at Nottinghill Family Wellness so that our chiropractors can help you. Why continue to suffer with headaches when we can provide excellent treatment and make life easier for you. Call us at 905-827-4197 to start treatment for your headaches today!